ALMATY (Reuters) - One evening last December, a crane lifted construction workers to the top of the ornate arched entrance to Uzbekistan's biggest commercial market. Overnight, they replaced the huge letters spelling out its title. It was more than just a name change. 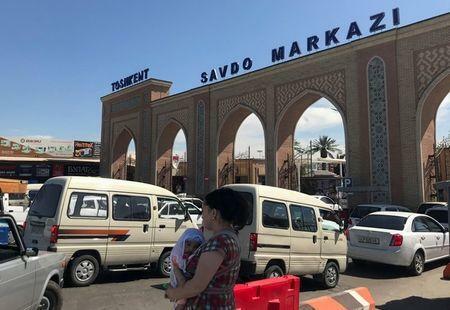 The rebranding of Abu Sahiy as Tashkent Silk Road was part of a shake-up at the market that marked a milestone in President Shavkat Mirziyoyev's drive to reform Central Asia's most populous nation. Mirziyoyev has been moving cautiously since being sworn in on Dec. 14, 2016. But the overhaul of Abu Sahiy sent a signal that change is under way in one of the world's most isolated states, a producer of gold, natural gas and oil. Autocrat Islam Karimov's 27 years in power had left Uzbekistan's economy stagnant and its consumer market of 32 million largely undeveloped. His family still controlled lucrative businesses when he died in office in September 2016. But by the time the workers changed the name above Abu Sahiy on Dec. 21, Karimov's younger daughter had quietly relinquished ownership of it, two sources familiar with the situation said. Lola Karimova-Tillyaeva and her husband, Timur Tillyaev, have never said in public who owns the market and controls the logistics companies linked to it. But a financier close to the government and an entrepreneur who works with the market confirmed to Reuters the couple had owned Abu Sahiy until late last year. For Karimova-Tillyaeva, 40, giving up the money-spinning market meant the loss of a prize asset that had helped her afford a lavish lifestyle abroad with her husband and children. For Uzbekistan's economy, the change of ownership ended what had been a quasi-monopoly at the market. This opened Uzbekistan's entire consumer goods sector to competition because almost all imported consumer items pass through the market. 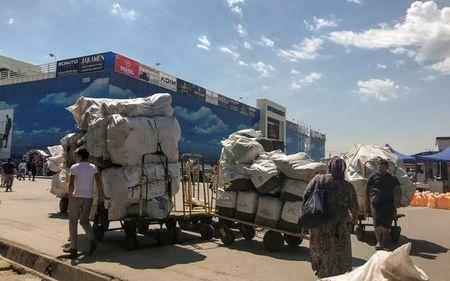 "It was very hard before to import anything, everything was done either through Abu Sahiy or using some crazy smuggling trails," said a businessman involved in Uzbek cross-border trade who requested anonymity. "Now, things have become easier to do... Many people from Tashkent and the nearby area have started actively travelling to Kazakhstan to buy something, from bananas to home appliances, mobile phones and computers." Mirziyoyev, 60, made the first official mention of the changes in a speech on Jan. 5. He did not name the new owners but said monthly tax revenues were flooding in from the market. Within 15 days of the reorganisation, the market had paid 35 billion sums ($4.2 million) into the budget. Previously it had contributed just 5 billion sums a month, he said. For Mirziyoyev, the overhaul also had another meaning. It marked the end of the Karimov family's dominance of Uzbekistan. Retreating further from public life since then, Karimova-Tillyaeva has resigned as Uzbekistan's representative to UNESCO, the United Nations' cultural agency, and as president of the Uzbek gymnastics federation. Her older sister, Gulnara Karimova, has not been seen in public for several years and state prosecutors have said she is in custody, being investigated for unspecified crimes. A businesswoman who also recorded pop songs, she was convicted of extortion and embezzlement in 2015. The president's office and the government did not respond to questions about the ownership of the market, and Reuters was unable to reach Karimova-Tillyaeva and her husband for comment. The couple's U.S.-based lawyer, Mark Raymond, said: "It is my understanding that all of your questions have previously been responded to and reported upon and thus my clients have no further comment." Although state media still avoid criticising Karimov and his family, there is now some criticism on social media by people emboldened by the dynasty's apparent loss of influence. 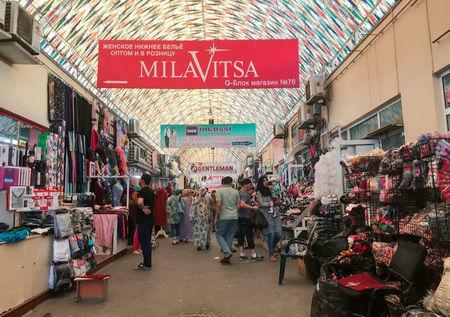 The bustling Tashkent Silk Road has a reputation for selling anything from food to phones in pavilions along walkways teeming with shoppers. "Elite perfume" is on sale next to cheap plastic toys, most of them from China and Turkey. Some of the buyers are individual shoppers. Others are wholesale merchants who haggle over prices, buy up large quantities of goods and hire a helper with a trolley to load their wares onto trucks parked outside. The changes at the market are the kind that foreign companies are looking for as they consider whether to invest in mainly Muslim Uzbekistan. Bordering Kazakhstan, Turkmenistan, Kyrgyzstan, Tajikistan and Afghanistan, one of its selling points is its location: although it borders neither China and Russia, it is a potential stepping stone between them. "The government should want foreign enterprises to come to Uzbekistan because it's ... treating all companies on the same basis and there is a level playing field," said Juha Kahkonen, Deputy Director of the Middle East and Central Asia department at the International Monetary Fund. Mirziyoyev, a former prime minister who acted as interim leader before being elected president, praised Karimov but also held out the prospect of reform when he succeeded him. He inherited a stagnant economy, a closed political system and a repressive security apparatus accused in the West of human rights abuses -- charges Uzbekistan dismisses. Some investors fear militant Islam could take a hold on the country. The government faced an Islamist insurgency in the 1990s and the impoverished Fergana Valley region remains a fertile recruiting ground for militant groups. Change is hard to measure in ex-Soviet Uzbekistan because it is secretive. Political and security reforms are proving slow, though the departure of long-time security chief Rustam Inoyatov in January showed Mirziyoyev consolidating power. Mirziyoyev also held talks in the White House with President Donald Trump in May, raising the prospect of an improvement in ties with the United States, which rented a military base in Uzbekistan until its troops were evicted in 2005. There are limits on how far Uzbekistan is ready to go on reforms. A senior Uzbek official said in May that Tashkent was prepared to privatise its state airline but would keep full control of its lucrative gold mines and oil firm. But the government liberalised foreign exchange rules last September, allowing citizens and companies to buy and sell foreign currency without restrictions at a market rate. Uzbekistan was the world's ninth largest gold producer in 2017, with output of about 100 tonnes and it produced 56.5 billion cubic metres of natural gas, official data showed. Oil output was 806,000 tonnes but it remains a net oil importer and in need of investment in its infrastructure. Nearly half of the first-quarter investment inflows went into the oil and gas sector, where Russia's Lukoil completed a large project in April, launching a $3.4 billion gas processing plant. In a less encouraging sign for foreign investors, Uzbekistan has announced that U.S. carmaker GM, a long-term partner, wants to sell its 10 percent stake in the GM Uzbekistan factory. It has offered no explanation but Mirziyoyev criticised the factory this year for failing to create jobs despite enjoying tax and other benefits for decades. An Uzbek news website quoted the state auto company chief as saying in May that Uzbekistan planned to buy the GM stake. So far, foreign money is coming mostly from institutions such as the World Bank and the European Bank for Reconstruction and Development (EBRD). But official figures show exports rose 59 percent in the first quarter of this year compared to the same period in 2017 and imports increased by 45 percent. Even so, foreign direct investment fell 29 percent to $575 million in the same period. The reason for this is not clear but economists say Uzbekistan has adopted more honest reporting standards under Mirziyoyev.